A Notary Public is an official of integrity appointed by state government —typically by the secretary of state — to serve the public as an impartial witness in performing a variety of official fraud-deterrent acts related to the signing of important documents. 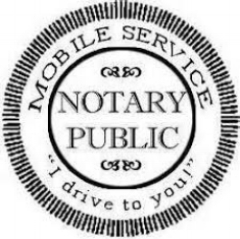 Mobile means that the notary travels to your location to make it convenient for you! I can come to your home, office, hospital, nursing home, assisted living, courthouse…even the airport! What does it mean for something to be notarized? Can you tell me what I need? A notary is NOT authorized to render legal advice. In fact, in some states a notary cannot even tell you what kind of notarial act you need. It’s actually your job to tell them! You should consult an attorney for advice on this topic if you are not certain. Can a document be notarized if the signer is not present? NO! The signer MUST be present and offer a valid picture ID. The notary is not validating the contents of the document, but simply asking if the signer understands the contents and then ascertaining and recording the identity of the signer. What is an Apostille? An Apostille is simply the name for a specialized certificate, issued by the Secretary of State. The Apostille is attached to your original document to verify it is legitimate and authentic so it will be accepted in one of the other countries who are members of the Hague Apostille Convention. What kind of documents do you notarize and what fees do you charge? A GENERAL Notary Public. (which I am at this writing)in the State of Maryland can witness signatures on many documents including LAST WILLS and TESTAMENTS, TRUSTS, AFFADAVITS, POWER of ATTORNEY, LIVING TRUSTS, BANK FORMS, DIVORCE DECREES, MINOR CONSENT TO TRAVEL FORMS, SCHOOL REGISTRATION DOCUMENTS. The State of Maryland sets the fees for Notary Public services at $4.00 PER signature PER PAGE and the TRAVEL fee base at $5.00 plus a $.55 PER MILE., round trip. I will witness and offer my seal to CERTIFIED DOCUMENTS, PRENUPTIAL AGREEMENTS. And though I AM a legal wedding officiant, in Maryland, the marriage rite is NOT a notarial act. I marry couples according to my ordination.